In case of an election night Doomsday, preppers are running up sales of emergency survival food. 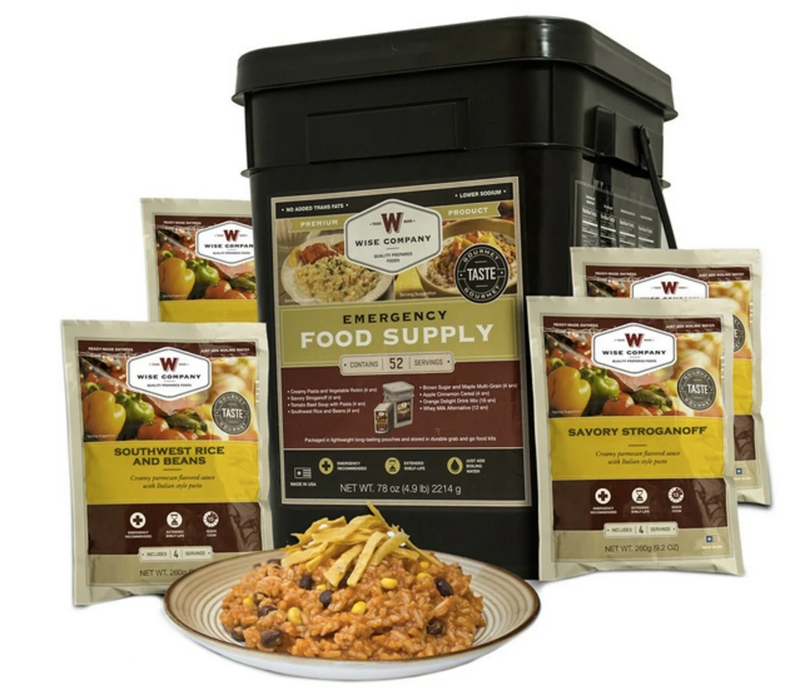 While sales for “long term food” typically see an increase around natural disasters and elections, “this is more intense than what we saw in 2012,” said Keith Bansemer, VP of marketing for My Patriot Supply, a manufacturer and seller of survival food. During the previous election his company saw sales double. This time it’s triple. Purchases at other long term food supply companies are up as well. Emergency preparedness online store TheEpicenter reports a 6 percent uptick in year over year sales. Another company, Legacy Foods, predicts they’ll see a 1-2 week spike in sales after the election — if Hillary Clinton wins, said owner Phil Cox. The meals, sold by the plastic bucket or tote bin, are typically dehydrated or freeze-dried food in sealed military-grade Mylar packs. Menu items include pasta primavera, Hawaiian Style Sweet n’ Sour, cheesy broccoli and rice soup, orange energy drink mix and chocolate pudding. They’re sold in bundles based on how long they’ll feed you. For $2,000 spent at Legacy Foods, you could eat three square meals a day for an entire year. That’s 1,080 servings. TheEpicenter has a 14-day supply kit for $235 that’s recently been “selling really well,” said owner Bryan Nelson. The most popular entry-level seller at My Patriot Supply is a 3-month supply for $497. It comes a in nondescript gray slim line totes bin designed to be easy to stack in the back of a closet or slip under your bed. Big name retailers are in on the game. Costco sells a 1-month supply of 390 servings in plastic gallon buckets for $114.99. Wal-Mart has a bucket deal, too. What’s feeding this new urgency? Survivalist consumers says they’re preparing for post-election unrest that could involve everything from massive riots, to power grid outages, to the total collapse of the financial system where a can of food becomes currency. And it’s not just guys digging a hole on their farm and filling it with MRE’s who are driving sales, companies say, but schoolteachers, moms, and successful financial planners. Nor is it limited to just rural areas. “Frederick Reddie,” a 41-year-old “urban prepper” from Pittsburgh, Pennsylvania is stocking up on staples like rice and peanut butter and working on expanding his 6-month supply of emergency food to two years. He has to use a pseudonym to protect his supply from any future hungry neighbors, he told NBC News. Either way, Freddy’s ready – with both supplies and a word of advice. The companies take pains to point out that they sell food not just for the collapse of civilization but also for camping, outdoor recreation, and natural disaster preparedness, like Ebola or volcanoes. Their customers are careful, self-sufficient and pragmatic types, they say, students of history who know things like stock market bubbles and crashes go in cycles and are taking small, meaningful steps, to reassert control over a toxic election. They’re always thinking ahead. Cans of food that last 25 years are “better than money in the bank,” said Nelson. “If you think the value of money is going to go down, then you could convert dollars into something tangible that you can use later” for either eating or barter. Bansemer said that his customers don’t necessarily fear a specific election outcome, but change itself.